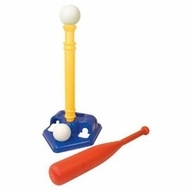 Practice your swing alone or with friends with this colorful T-Ball Set! This fun set features a sturdy base adjustable height and comes with a bat and two balls. Packaged in a colorful corrugated carton with full color litho label.